The surgery staff at Nell J. Redfield Memorial Hospital provides high-quality surgical care to meet the expectations of the patients we serve in Oneida County and the surrounding areas. 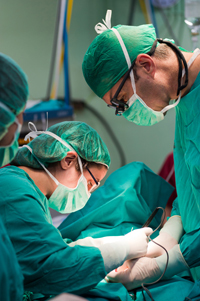 We are fortunate to have an experienced and caring staff of surgeons, anesthesia, nurses, and scrub techs that are focused on your successful surgery and recovery. We understand that facing surgery can be stressful, but you can help ease that stress by having surgery close to home with a staff that cares about you and is concerned that you have a positive outcome. At Nell J. Redfield Memorial Hospital, surgery is performed in a modern operating suite that is equipped with advanced surgical and laparoscopic equipment. Our surgeons have expertise in general surgery as well as specialty areas. A very important reason to consider our hospital for surgery is that we continually achieve a 0% post-op infection rate, much lower than most area hospitals, helping you to a faster, healthier recovery. The Nell J. Redfield Memorial Hospital offers many surgical procedures, and you will receive quality care from the surgical staff that serves you. Dr. Bitner performs Orthopedic Surgeries at NJRMH such as; Knee Arthroscopy, Shoulder Repair, Carpel Tunnel, Fracture Repair Ligament and Tendon Repair and many other Orthopedic Surgeries. Dr. Murphy performs General Surgeries at NJRMH such as; Laparoscopic Surgeries including Gallbladder Removal, Appendectomy. Hernia Repairs, Breast Biopsies, Port-A-Cath Placement. Dr. Murphy also performs EGD and Colonoscopy Procedures. Dr. Jones performs Gynecological procedures at NJRMH such as; Hysterectomy, Bladder Repair, D&C, Endometrial Ablation, and treatment of Ovarian Cysts and Endometriosis. Dr. Christensen performs Podiatry procedures at NJRMH such as; Hammer Toe Repair, Bunionectomy, Tendon Repair including Achilles, Bone Spur Removal, Toe Nail Removal. Dr. John Strobel M.D. and Dr. J. Fritz Schmutz M.D. along with a select group of Interventional Radiologists perform Vascular Procedures and Pain Management at NJRMH such as; Vertebroplasty, Kyphoplasty, Endovenous Laser and Sclerotherapy Treatment (Varicose & Spider Vein Repair). PICC Line Insertion, Epidural Injections for Pain Management and Nerve Block Procedures.